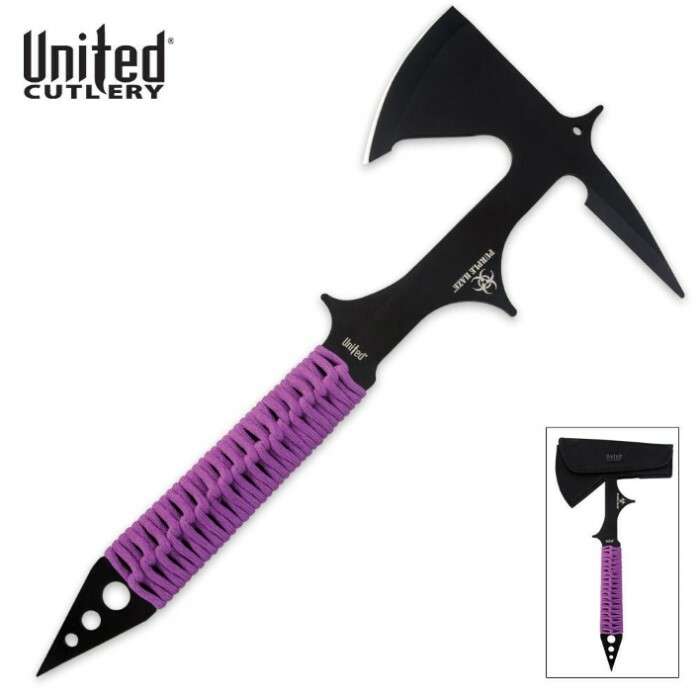 The Black Ronin Tactical Tomahawk axe features a tempered 420 stainless steel, one-piece full tang construction, black non-glare finish with purple nylon cord wrapping grip. Included is a weather resistant black nylon sheath with belt loop and Velcro closure. 15 1/8 in. overall. 3 1/2 in. axe head. Purple edition of our Black Ronin Tactical Tomahawk - Throw Chop Spike, with deep purple cord wrapping and biohazard artwork. Perfect gift for the gay ninja in your life.